GOLCONDA Corrosion Control (P) Ltd., formerly Golconda Enterprises, is an ISO 9001:2000 Certified and professionally managed Engineering concern for manufacturing all types of Cathodic Protection Materials of International Standards. Corrosion, in whatever form, corrodes not only metals but also the profits. Assets made of any metal, exposed to the elements and left unprotected are eaten away slowly but surely. To protect the profits, it is wise to protect exposed metallic assets. Thanks to the state of the art technology in Corrosion Prevention, it is now possible to protect any metal from corrosion, thus optimizing their life and maximizing the profits in the long run. 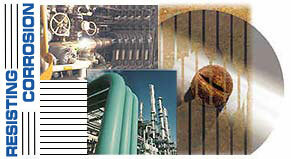 No wonder, in industries where metallic assets are dominant, Corrosion Protection is a buzzword. The Engineering team of GOLCONDA Corrosion Control (P) Ltd. is headed by a Senior Engineer whose track record runs through almost two decades of Cathodic Protection Engineering experience. He had his 'On Job' training in USA and Europe and was associated with reputed International Units in the Middle East. The Professionals of GOLCONDA Corrosion Control (P) Ltd. are experienced and well equipped to undertake special Engineering projects of Cathodic Protection including installation, supervision, testing and commissioning. GOLCONDA Corrosion Control (P) Ltd. has a total commitment to the objective of quality assurance through reliable in-house quality control system and an independent external quality check of the final products. To establish Golconda Corrosion Control (P) Ltd. as a reliable supplier of quality products/services in the field of Corrosion Protection by meeting customer expectations and strive to achieve sustained improvement of QMS. The strategic location of GOLCONDA Corrosion Control (P) Ltd. lends it the advantage of quick and easy access to all essential inputs required for production and upgrading the technology in the field of Corrosion Control. Hyderabad, the fast emerging Silicon Valley of India has well established and modern industrial units for the primary facilities like melting, casting, forging etc. It has a culture of research and development with national level laboratories in key areas of research. It is also called a city of universities with more than half a dozen universities of both Central and State level located here.